What should have been a birthday celebration with family last Sunday soon turned into a harrowing encounter between a Chesterfield family and the Richmond Police Department (RPD) and has raised questions about how police apply force against people with special needs. On the evening of May 6, as the RPD was responding to reports of a hit-and-run, they came into contact with McKhyl Dickerson and his uncle, Kerry Lewis, in the parking lot of the Belmont Hills Apartment Complex on Lamplighter Road in Chesterfield. 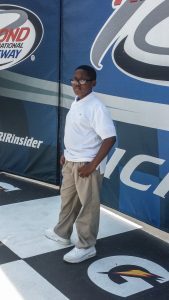 McKhyl, a 14-year-old boy – who is diagnosed with autism and an auditory processing disorder – a condition that affects listening and comprehension, was enjoying a race with his uncle to his grandmother’s apartment when they saw the police lights in the parking lot of her complex. Shortly after, a female officer asked the teen to stop which he failed to do. Edith claimed that her grandson had simply asked the officer to follow him to her house. While she did not see this portion of the incident she stated, “this is when they apparently slammed him against the wall and on to the ground.” Hearing the commotion she went outside and found that the police had him handcuffed with his arms pulled about halfway behind his back with the officer’s knee in his leg. At this point, she asked the detaining officer to let her come over and calm her grandson, identifying him as a teen with special needs. Edith went on to describe a situation in which her autistic grandson was hysterical, failing to comprehend what was happening. This was something also corroborated by the teen’s mother Nichele. 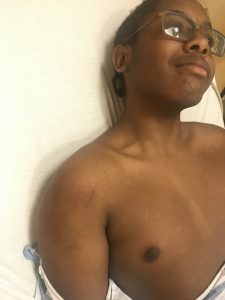 “The police officers were thrashing my son,” she commented, going on to say that because of the incident the teen had to be admitted to St. Mary’s Hospital in Henrico. While the hospital did not answer an email request for information, Nichele said, “He was in pain…he has contusions, abrasions, he is on crutches, and has a brace around his leg and ankle, his body hurts.” When asked if this was all due to the way he was treated by the officers, Nichele gave a simple, ‘yes’, in response. RVA Mag reached out to the RPD for comment on the incident. Gene Lepley, a spokesman for the RPD, confirmed they are reviewing this incident, but could not corroborate specific details due to the incident being investigated as a “personnel issue”, but at least four points of contact, including Chief Durham and the Captain of Internal Affairs have been in contact with the family. Encounters between people with special needs and police can be perilous. A report released by Virginia’s Treatment Advocacy Center going back to 2015 indicated that people with special needs are “16 times more likely to be killed during a police encounter.” The report also determined that a weakening of the mental health system has placed an undue burden on law enforcement officers who are not necessarily trained to respond to people with special needs. Autism Speaks, an advocacy organization, has compiled a list of information and behaviors for law enforcement officers on how to interact with people with autism. As a way to mitigate these encounters, the National Alliance on Mental Illness (NAMI) recommends that law enforcement officers learn crisis intervention training (CIT), a community policing model that helps police improve their response to deal with people with special needs. Rhonda Thissen, the Executive Director of NAMI in Virginia, said this kind of case is surprising since both Richmond and Chesterfield have crisis intervention trained officers. “The Commonwealth of Virginia has been supporting and promoting crisis intervention team training across the state for almost 10 years now,” said Thissen. When asked if the two officers involved in this incident had CIT training, Lepley said he could not comment on that.